One of the most difficult parts of the transition from college to full-time work is ditching your favorite bookbag for something more . . . suitable for the office. Your Jansport backpack may have stuck by you through countless library treks and day hikes, but you’d might as well be carrying a Hefty trash bag once you try to match it with those fancy clothes they make you wear for work. Switching to a briefcase is the obvious next step, but then you’ve got to lug it by hand, which can get tiring pretty quickly. Messenger bags are great, but most of them look cheesy when you drape them over a suit — as if you couldn’t decide whether to dress up or down. 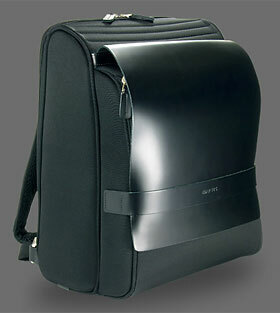 How about a briefcase with a strap? Sure, but wouldn’t that be . . . like wearing a man purse? What to do? Here at the Satchel Pages, we have our own opinions as to what truly constitutes a man purse. To us, if you’re carrying a backpack you’re wearing one already. But you don’t have to agree with us to want a bag that fits well with fancier work clothes. And so we were intrigued to find a line of bags called Marsus, whose promotional material identifies the problem precisely . . .
. . . many professional men face difficulty in finding stylish laptop bags which can match well with their sleek and professional working suits. As a matter of fact, we have seen many professionals wearing designer suits, while carrying outdoor backpacks or tattered old briefcases. The image these men project is not very impressive at all.
. . . and then to see the Marsus line of Modern Laptop Backpacks, which look perfectly work-suitable. We’re most interested in the DV03 “Sophisticated Space Organizer,” a Teflon-treated nylon bag with a secure Napa box leather flap. It contains a sleeve for a 15-inch laptop, a satin-lined central storage space for files and work stuff, and a separate outer pocket for accessories. At $230, this backpack ain’t cheap. But it doesn’t look cheap either. This entry was posted on Wednesday, April 26th, 2006 at 12:09 pm	and is filed under Backpacks, Bookbags, Briefcases, Fashion, Laptop Bags, Man Bags, Manufacturers, Marketing. You can follow any responses to this entry through the RSS 2.0 feed. You can leave a response, or trackback from your own site.